10 GHz (X-band) airborne radar system. The switch box is placed between the antenna splitter and the receiver first mixer (a silicon point-contact diode). The gas in the switch (a mixture of hydrogen and water vapour) ionises and forms a low-resistance plasma when the transmitter magnetron emits a pulse, and then quenches rapidly so that the receiver can detect the radar echoes. The electrode gap is adjustable by means of a copper bellows. The wire connection is for priming bias (known as the 'keep-alive' voltage). 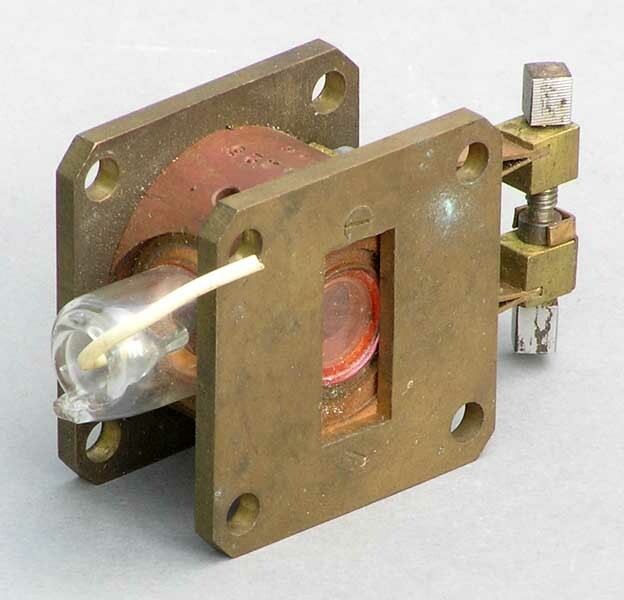 * This example is probably an early Ferranti TTR31MR (CV5162) with the cover of the keep alive electrode missing (there are screw holes for the cover on either side of the external glass tube). Later versions had a calibrated bellows adjuster. Microwave Duplexers. Smullin et al. MIT Radiation Laboratory Series. Volume 14. See also: Wikipedia, Sutton tube.